There's a lot of history right here in Colorado that I haven't really explored enough of. Take Cripple Creek, for example. Last weekend, I went with my parents, and observed while they gambled at the various noisy, flashing slot games. Now, I'm not one for throwing my hard earned cash into a machine (except old school arcade games and pinball machines), but it sure seemed like they were having fun. Especially when the money goes up instead of down. I know that there's been gambling going on there since there were enough men to sit around a table with a deck of cards. The old brick facades of the casino seemed to taunt me with their faded history. As I walked up and down the main drag, I could imagine dirty, tired miners bringing down their gold nuggets from the hills, ready to spend their wealth on whiskey and whores. The stories and songs of the place just seem to seep up out of the ground. I got the feeling there was a lot of blood mixed in with that dirt. Blood and corruption. It occurred to me that this is a place that people have come for many years to show off and blow off steam. I saw fine gentlemen in hats, ladies all dressed for a night on the town, peacekeepers patrolling the streets, making sure that the local toughs don't roll you for your recent winnings. Children eating sweets, dogs begging for scraps. Craftsmen hawking their wares on the street. Lowlifes leaning against the age-darkened brick of a building that their great-grandfathers frequented, selling God only knows what to unsuspecting addicts. This could have been 100 years ago, and only the clothes would have been different. I walked way up the hill towards the train, and found an antique shop that also made 'old timey' photos. I nearly fell victim to an 80 year old lace parasol in the store. Seriously, what on earth would I do with that? So I opted for the photo shoot instead. The nice couple working the props tried really hard to get me into a dress, but I would have none of that. "Give me a gun and a bottle of whiskey!" I said. "Oh, you're one of those girls, huh?" Yes, apparently, I am. 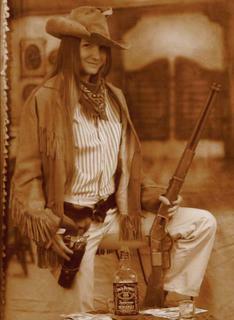 Calamity Jane reincarnate. Except I can't hit the broad side of a barn with a rock on a good day. Let me tell you that gun was really, really heavy. The only way I could've hurt anyone with it would have been to drop it on their foot. As I posed for the camera, I wondered: "Would I make a good extra on Deadwood?" Naw, they'd probably try and put me in a dress, too. And they've already got a Calamity Jane. Oh, well. There happened to be a classic car show as well (as if I didn't have enough anachronistic things on my mind) and a whole bunch of bikers came cruising through town on their modern-day horses. I got that double-image past and present feeling again, and imagined ghostly horsemen riding alongside them. Damn it all if I don't want a Harley now.